The 1-Wire to BACnet IP, Modbus TCP or RTU, and Web Gateway acts as a protocol converter. It allows 1-Wire devices to communicate with devices on a BACnet IP, Modbus RTU or TCP, and Web System. Chipkin's 1-Wire™ Gateway is a protocol converter for 1-Wire DS18b20 temperature sensors. The Web (HTTP, XML, REST, Json, MQTT) driver allows the Gateway to push data to the Web via a variety of Protocols. The Modbus TCP driver allows the Gateway to transfer data to and from devices over Ethernet TCP/IP using the Modbus protocol. The Modbus RTU driver allows the Gateway to transfer data to and from devices via a serial RS485 connection using the Modbus protocol. The BACnet IP Driver allows the Gateway to transfer data to and from devices over Ethernet UDP/IP using the BACnet IP protocol. Chipkin™ 1-Wire™ Modbus® RTU/TCP, BACnet® and HTTP gateway is a protocol converter for 1-Wire DS18b20 temperature sensors. The gateway operates by reading the temperature data from the 1 or more DS18b20 1-wire sensors into an internal database. The values read from these sensors then can be read from Modbus® RTU/TCP, BACnet® and HTTP. The gateway requires minimal configuration and can be considered a ‘plug and play’ component of any network system. It’s ready to operate ‘out of the box’ and can be installed without an engineer’s approval. For a list of tested devices, refer to Appendix A: Tested Devices. 1-Wire™ Modbus® RTU/TCP, BACnet® and HTTP gateway is a protocol converter for 1-Wire DS18b20 temperature sensors. The gateway operates by reading the temperature data from the 1 or more DS18b20 1-wire sensors into an internal database. The values read from these sensors can then be read from Modbus® RTU/TCP, BACnet® and HTTP. The CAS BACnet IP driver allows the CAS Gateway to transfer data to and from devices over Ethernet UDP/IP using the BACnet IP protocol. The CAS Gateway can either be a Client, reading and storing values from a BACnet device, or a Server, making data available as BACnet objects. Note: Chipkin is always updating the BACnet IP Driver. For a recent list of supported services, please visit www.chipkin.com or contact us. If there are services that you require that are not listed, please contact us to discuss how we can add them to the driver. 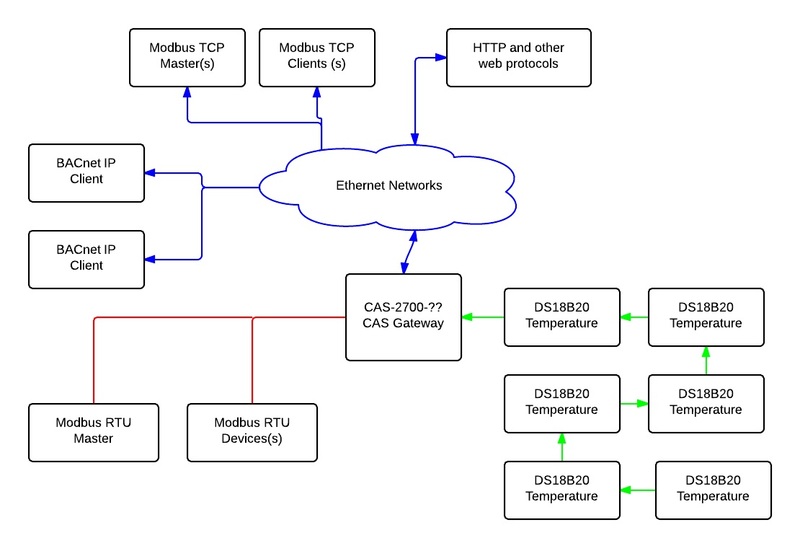 The CAS Modbus TCP driver allows the CAS Gateway to transfer data to and from devices over Ethernet TCP/IP using the Modbus protocol. The CAS Gateway can either be a Client, reading and controlling values from a slave, or a Server, serving data to a Modbus Master. The CAS Modbus RTU driver allows the CAS Gateway to transfer data to and from devices via a serial RS485 connection using the Modbus protocol. The CAS Gateway can either be a Client, reading and controlling values from a slave, or a Server, serving data to a Modbus Master.